A United States Cork Board Push Pin Travel Map! These maps are great gifts to the road warrior or adventurer in your life. Track your road trip, visit all 50 states and brag to your friends about the places you have seen. Adventure awaits. But don’t wait! 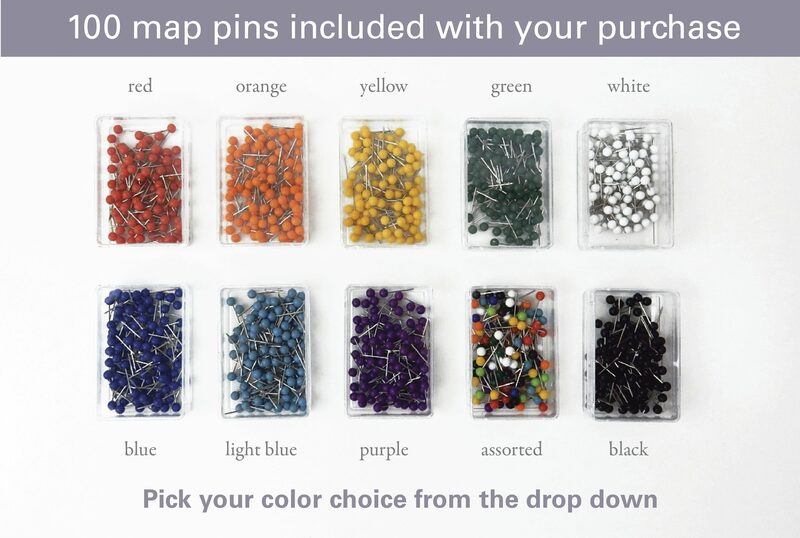 Get your cork board push pin map now to track your travels in style! Also available as a solid map option here. Let us know if this map is for a couple, family or a singular person. The legend will reflect plural or singular. Show off your United States travels and future travel plans with this unique laser engraved cork board push pin US map. This also makes a great 5th year wedding anniversary as cork is wood! • the top text to your names or a short quote. • the text of the 3 legend options. 23 x 17 inches with an oak finish wood frame! Mounting hardware and instructions are included for quick and easy mounting. While we engrave our custom artwork and designs on the material, Jessica Design Studio, LLC does not physically construct the cork board or frame. Digital proofs will NOT be provided with this listing. Please ensure the correct spelling of names text before ordering. Errors when ordering will be the responsibility of the buyer. Ensure accuracy at time of order. All orders are put on a wait list. The standard processing time for this item is 2 weeks plus shipping. Rush upgrades are available for $25 and speed up the processing time to 3 business days. Came out amazing! Thank you so much! Beautifully done. Quick response/shipment. Very pleased with the purchase.